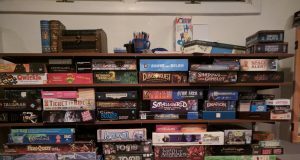 Like most gamers, I am a bit of a dice junky. The bizarre contradiction is that while I enjoy buying interesting dice, I rarely enjoy actually using them at the table. My most recent purchase is pictured above, a couple of very old-school d20s printed with 0-9 twice. For some reason I found myself recounting two historical tidbits around these to a lot of fellow gamers recently – that the original polyhedrals were educational tools that were later co-opted by gaming, and that they did not include a d10 but the d20 had 0-9 printed on it twice. 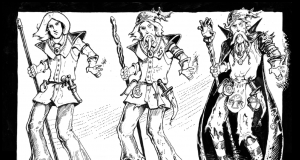 I’ve seen old school gamers either ink half of the faces differently to denote when to add 10, or just roll a d6 alongside and add 10 when the d6 comes up 4-6. I rather like the latter myself, as I find it much more satisfying to roll a pair of dice than a single die. As a side note – does anyone know more about this background of dice as educational tools? I find that story re-told a lot, and I’m pretty sure I’ve heard Frank Mentzer tell it, so I don’t doubt its veracity. However, the detail I never hear is exactly what kind of lessons were taught with them. Is it geometry? Probability? Something else? Anyway, I decided to purchase a couple to have on hand for visual aid when recounting these stories. I may try using them at the table for a lark, but I won’t be surprised when I abandon them for my current favorites, a standard set of yellow Game Science dice. Whether you buy into Lou Zocchi’s claims of the improved probability distribution of these dice or not, I do find I quite like the sharp feel of them. My only disappointment is that the d6 is a little small and uses roman numerals instead of pips. I don’t know why, but for some reason I prefer my d6 with pips. 1. In high school I kept a smashed up d20 in my dice bag. It repeatedly rolled ones and I heard an ammusing story at GenCon of someone smashing such a die and keeping the remains with his other dice “to teach them what happens if they roll poorly”. Of course it’s completely silly, but the largest chunk of the d20 I smashed happened to feature the 1 side pretty prominently, and it was a good joke to tell whenever it tumbled out of the dice bag. 2. For a while I bought several sets of the jumbo sized dice – I think I now have six in total. My theory was that it would always be obvious which dice were mine, should they get mixed up or someone need to borrow dice. Ultimately they’re a tad unwieldy, but I do enjoy occaisonally bringing them out when I need to make a good damage roll – because obviously bigger dice will roll bigger damage. 3. For a while I engaged in a silly tradition of looking through the dealer hall of GenCon for a “bigger d20”. It started with buying one of those tennis ball sized d20s which I understand are actually used by magic players as life counters. The next year I bought a plush d20 about the size of a cantaloupe, and then the next year I found a larger plush d20 the size of a basketball. After that I knew I was going to create a luggage problem for myself so I stopped. 4. When I was running my B/X compaign I bought a large number of d8s and ketp at least a dozen behind the screen at all times. They were convenient for tracking hitpoints of the monsters. Fighting a dozen orcs? No problem, I’d scoop up a dozen dice and roll them behind the screen. When a player hit one I’d rotate the die to mark the hit points remaining, and eliminate the die when the orc died. For multi hit-die creatures I would group the dice by color, rolling pairs for zombies or even 4d8 for each ogre. I would even do ten or more dice for one big single creature, but when the party was facing multiple creatures with 5 or 6 HD it started to become easier to just write down the number on a piece of paper. I still keep a lot of d8s in my bag and use this technique when running D&D at convention games. 5. I’ve had a huge variety of dice bags that I’ve never been happy with. From old eyeglass cases to a hand-sewen satin lined velvet bag for the big dice, none of them ever really made me happy. Recently my pals over at Dark Pheonix gave me one of their dice bags, and I think I finally have a winner. It’s super big, quite sturdy, and the top opens really wide which makes it easy to paw through the dice looking for the right one. 6. At GenCon there was always at least one booth that had a giant fish tank of dice and would sell them by the pitcherful. I think it was like $30 or something and they gave you a liter sized pitcher and you scooped up as many dice as you could. I gave in one year and purchased a pitcher of dice. When I returned home I purchased a small decorative chest from Michael’s to store them in, and I now keep this by my gaming table as loaner dice for anyone that needs them. I think the players who do need them rather enjoy pawing through the pile looking for just the right ones. Ah dice, what other hobby implement is so imbued with superstition and sentiment? And when will I stop pouring out my hard earned cash for yet more tiny hunks of plastic? The spare d8’s as monster HP trackers is a new one to me. I like it. It’d keep ya from having to scribble all over your map key. It works pretty well, provided you remember to put them in a different location than all your other dice. I have on occasion scooped up a d8 to roll damage against a player and then realized that I just rolled the monster’s hit points. Designating a specific color of d8 for that purpose might help with that. Of course unless you wanna go out and specifically buy a bunch in that color you gotta work with what you got. The first time I saw this was from Max H. in his campaign, and I was very impressed by the idea; neat and quick. He made no attempt at hiding them, either (no screen, etc.). It definitely works best for 1 HD monsters and less well for giant things. Definitely lots of good info there, but it really focuses on the appropriation of polyhedral dice by the gaming community. It does not speak at all of the intent of the original manufacturer, which I’ve heard through many sources was educational in nature. I’d love to hear from someone that made or purchased these dice prior to their use in gaming. Upstairs was a small game section — the games at the time being purely ones with military miniatures. (Board games in England were a rarity back then.) 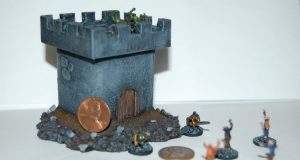 Amidst the Military History books, painting guides, and miniatures was a small bin containing a handful of 20-sided dice. OK, so D&D was going to be published. We needed a source of 20-siders. The boys in Geneva found a source on the West Coast. It was a small educational toy company that sold sets of dice for showing shapes. Each set had 1-4 sided (yellow), 1-6 sided (pink), 1-8 sided (bright green), 1-12 sided (light blue), and one 20-sided (a white one numbered 1-10). That perhaps at least explains the claim that they were used for education, though presence in an educational toy catalog does not necessarily connote intent as an educational tool by the manufacturer. The “Must List” article shown in the Playing at the World post claims that the dice were available from a Japanese company – Japanese Standards Association in Tokyo – but to what audience that company was marketing the dice is left unclear. Also, I found this picture showing the original packaging of the Japanese Standards Association dice, which labels them as “random numbers generating icosahedron dice”. This suggests either that these dice were in fact for studying the laws of probability, or that the manufacturer was being very coy about producing something that could ultimately be used for gambling. Very cool! Never seen that.